From a nursing home in the 1950s to contemporary residential care and community care services today, we have always been underpinned by the Catholic faith. For over 55 years, the Aged Care Board of the Catholic Diocese of Port Pirie, on behalf of the Bishop of Port Pirie, has provided caring services to older people in our homes, and in theirs. Reaching out from the towns to remote areas in the northern, mid-north and Yorke Peninsula regions of South Australia, following the teachings of the Gospel, the Diocese has always been involved in charitable and social endeavours of benefit to the whole community. The oldest nursing home in Port Pirie was established in 1958 on the current site. In 1978, old buildings were demolished and new buildings erected to provide a more modern approach to aged care. Previously known as Clara House and Nazareth House, the new home was named St Joseph’s House in 1994. These facilities were refurbished in 2012 and are now known as the St Clare and St Mark areas. 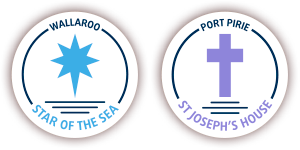 Planning for a hostel in Wallaroo commenced in 1975, and a 20 place facility named Star of the Sea opened in 1978. A nursing home commenced operation next door in 1985, followed by a major refurbishment of the hostel in 1988 adding ensuites to all the bedrooms. The nursing home expanded during 1993 with the addition of the new Monsignor Ray Pope wing. In 2001, the older section of the nursing home was replaced with the Saville wing and a further extension of an additional wing, Little Company of Mary. A subsequent expansion to the nursing home with the Mary McKillop wing was completed in 2013, together with the new Administration Centre, with the first residents received for admission in January 2014. In 2005, Star of the Sea was granted authority to offer Home Care Packages, enabling caring for older people in the Wallaroo area who preferred to stay in their own homes. The spirit of community has always been at the heart of what we offer.